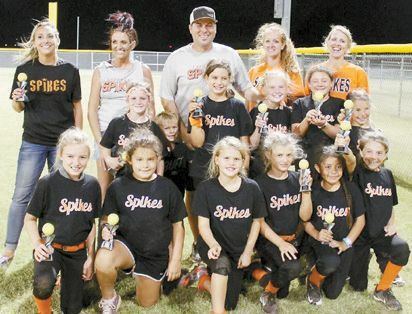 The Cheyenne Spikes Softball Team recently won Runner-Up at the Fall Softball League in Elk City. Pictured, kneeling: Lily Barfield, Lexy McDaniel, Emory Vickers, Kynli Carlson, Kyana DelaCruz, Rossi Baker. Standing: Cambree McGlothlin, Kimbo Denney, Avery Cannon, Natalee Webb and Emma Bogges. Not pictured Katelin Scott. Coaches are Lyndsay Bogges, Trisha White, Clint Vickers, Tara Denney and Leisha Carlson.